Glamping, glamorous camping, whatever you want to call it, is more than simply staying in a beautiful, luxurious bell tent or yurt (or any of the other types of glamping accommodation). Great British Glamping believe it’s about getting outdoors, away from the everyday, and discovering a totally different way of finding adventure. Whether you’re seeking a romantic break, celebrating with a group of friends or looking to have a fun-filled family break, glamping could very well be your answer. Glamping is an activity in itself, and is also a launchpad for a multitude of often new, exciting, fun, outdoor and memorable escapades. 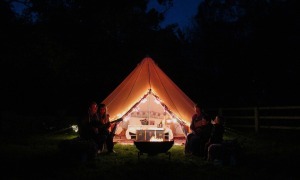 In Great Britain, the camping – and therefore glamping – season typically runs from March/April through to October. However, given the increased luxury afforded to glampers this period can now extend year-round. Simple. Somewhere you glamp. Like a campsite but more glam. A dome or bell-shaped tent usually made from naturally breathable and durable unbleached canvas. A central pole supports the structure and the stability is secured by guy ropes that come off the wall/roof junction and are secured by pegs into the ground. Modern bell tents are typically waterproof, mildew resistant and flame-retardant. They range in size and can accommodate groups of people in one space with ease. Bell tent design evolved from the Native American Tipi and were widely used throughout the 19th century by the British Army. Bell tents are easily erected and struck enabling great flexibility. Great British Glamping use luxury 5m bell tents with integrated ground sheets, insect netting and marine-grade guy ropes. A yurt is a form of shelter or dwelling traditionally used by nomads in the Central Asian region. Yurts are portable circular structures comprising a (usually) steam bent compression wheel, with supporting roof ribs. The top of the wall and the base of the roof is prevented from spreading outwards by a tension band which couteracts these forces, resulting in a near-rigid frame. The skin of the yurt is usually covered by layers of fabric, felt or wool for insulation and weather-proofing. Yurts take a little longer to erect than canvas dwellings and so are usually in place for several weeks or months at a time. A tipi (also known as tepee and teepee) is a conical tent structure built of wooden poles that create a frame over which animal skins would traditionally have been hung. Nowadays modern tipis are made from canvas. The tipi is durable and relatively easily moved, and provides warmth and comfort in the colder months and is cool in the heat of summer. Traditionally used by nomadic tribes of Native Americans, early tipis would have been smaller than the more modern equivalents today, allowing the tribes to strike camp and follow the buffalo herds during migration. As transportation methods improved, the size of tipis increased; models are available now that can accommodate relatively large groups of glampers. Safari Tents – so called because of their use as accommodation on African adventures – are large, often multi-roomed, canvas and framed structures that offer larger space for big groups or families. Often set on a wooden deck with veranda at the front, these tents offer a spacious dwelling from which to launch your adventures or simply enjoy a sunset gin & tonic. Shepherd’s Huts were predominantly used in the 19th and early 20th centuries by shepherds during sheep flock movement and lambing. Constructed from timber and iron and equipped with iron wheels they provided sleeping, eating and working accommodation all-in-one, plus much-needed shelter from the elements. In more recent times, shepherd’s huts have been salvaged and transformed into beautiful, transportable cabins accommodating couples on romantic retreats, families seeking adventure under the stars and festival-goers wanting something a little more sturdy than a tent to stumble into after the gig. There are an increasing number of uses of reconditioned shepherd’s huts including garden rooms and offices, but Great British Glamping thinks these will always hold a place for glampers of all types. For those that seek a more rigid dwelling or are perhaps in a colder climate that requires more cosiness, a log cabin could be the perfect answer. As you’d imagine these can come in all shapes and sizes but can be as off-grid as any tent (although admittedly not as portable!) allowing an escape to the great outdoors. If a log cabin is too grounded for you why not head upwards. Increasingly rising in popularity, tree houses are becoming a great style of natural accommodation for children and grown-ups alike. After all, don’t we all have a secret desire to relive our childhoods once again? A relatively simple two-piece cast iron pan comprising a heavy-based cooking pot and a lid (which can, in some models, be a pan in its own right). Suspended by a metal handle over an open fire by a tripod many different dishes can be cooked using this versatile method. A phrase used to describe how, in the example of glamping, there is no dependance on public utilities especially electricity and gas, but also commonly water and drainage. Off-grid is about living in a backwoods way (not backwards, that would be a bit silly) and minimising detrimental impact on the environment. In recent years the use of compost loos, sustainably managed timber and harnessing solar energy have led to a surge in off-grid campsites being able to provide a more ecologically-sound experience for people seeking an outdoor adventure.